Pembrokeshire Wales How To Get Here. This page gives details of the various ways to get to Pembrokeshire. The main access to the county from the east is via the M4 to junction 49 and then via the A48 to Carmarthen and the A40 west to St.Clears. For the south of the county, follow the A477 signposted for Pembroke Dock and Tenby. For the centre and the north of the county stay on the A40 for Haverfordwest and Fishguard. Travelers from the north Midlands and the north of England should head for Aberystwyth and follow the A487 southwards through Cardigan to Pembrokeshire. 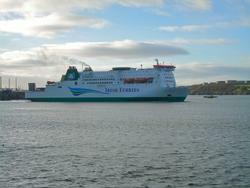 Ferries sail from both Fishguard and Pembroke Dock. The county has two ferry ports, both served from Rosslare Harbour in Ireland. Stenna Line Ferries sails from Fishguard and Irish Ferries sail from Port of Pembroke. Both routes operate twice daily throughout the year and the Stenna Line service is augmented during the summer months with sailings by fast ferry, giving up to four departures per day. For private flyers, there is an airport at Haverfordwest.